Permanent Makeup Artists that come to your home or residence! ​Shear Convenience specializes in the home and hospital convenience of bringing beauty services to the Etobicoke, Mississauga, Brampton, Toronto, Thornhill, Richmond Hill and Markham areas – a mobile beauty salon known for its reliable and professional services second to none. We offer a friendly and expert service any time of the week that suits our client needs and convenience. Hair and beauty is our passion! Instead of wondering where are 'hair salons near me' are, think of Shear Convenience Mobile Hairstylists. We are always near you. Just a call away. Exceptional stress free services in the setting of your choice. Let our mobile beauty spa and professionals get you looking and feeling beautiful and confident. No matter your age, we know the styles and how to deliver the look you are striving for. Don't worry about tools and towels, that's on us. We work with sanitized tools and materials and our mobile hairdressers always sweep and clean where they worked. The only tell-tale sign we were there is the mirror. There is most likely a mobile hair stylist near you today. So, no matter how you are dressed, whether you are at home or in a hospital or other institution, we'll be there to create the look you want today. Mobile Hair Salon Services Include Permanent Make-up - Waxing - Manicures - Pedicures - Massages - Facials​. Curls and Blow-drying right at home. Shear Convenience is true to our name. We could not make it any more convenient to have professional hair styling and family hair cutting in the comfort of your own home, or wherever you prefer to get your hair needs looked after. Our stylists are professional, experienced and creative whether they are in an elite salon, or in your own home or institution. Best of all, they guarantee their results and your satisfaction. 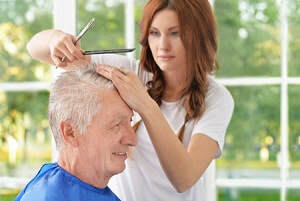 ​For seniors who are having difficulty with excursions and getting out to pamper yourself, it’s easy now with Shear Convenience to look after you and your comforts for hair and appearances. Looking good is a sure-fire way to improve your health, your morale and your self-esteem. We all know that circumstances can sometimes prevent you from being able to travel outside the home for periods at a time so what could be more beneficial and convenient than having personal hair care, facial and foot care needs attended to. To all siblings: having your your mom / dad pampered by having a certified hair stylist, make-up expert, or massage care pro for their personal needs in the comfort or privacy of their home, residence, or hospital bed is one of the most considerate and loving things you can do. Mom and Dad are proud and may not ask for home service, or may not even consider such a service might be available. Call us and we can put together a package that will be sure to please you and your favourite recipients. 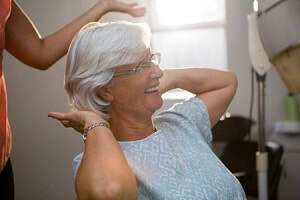 It is extremely important to us that we understand our very special seniors and their needs; that we treat all of our clients dignity and the utmost respect. At Shear Convenience it is easy to imagine all of our senior customers as if they were our own parents. The ability to apply permanent make-up has so many benefits such as shadowing balding areas or making the appearance of lips seem fuller or aiding in eyebrow definition. It's not new, in fact the procedure goes back hundreds of years. We have perfected the application and look forward to any consultation you might want in this area. Send in your request and we'll get back to you right away. We value your interest. Bring a light mood and make our visit enjoyable for you! Clean Up thoroughly after our service is complete.